I am cooking eggs for chickens. Why in the world would I cook eggs for chickens? Good question. Yes, we raise chickens for fresh eggs and yes we discourage them from eating those eggs! Unless I want to give them a treat. Eggs are a good source of protein not only for humans but for chickens, too. They will gobble them right up! The key to feeding your chickens eggs is to make sure you cook the eggs before feeding them back to the chickens. 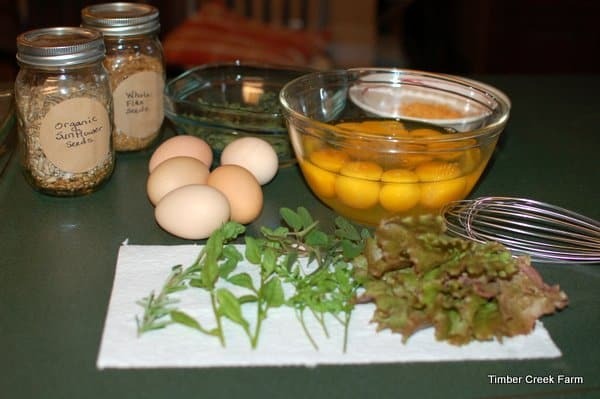 Cooking eggs for chickens is fun because you can add all sorts of good extra nutrition items into the mix. One dish I enjoy cooking for the chickens is a large baked egg dish. I start with eggs from our hen house, but use the ones that are slightly irregular or have some sort of appearance that makes me hesitate putting them in the eggs cartons we sell. This is the time of year for egg abundance and I want to reward my chickens for their production with occasional treats. 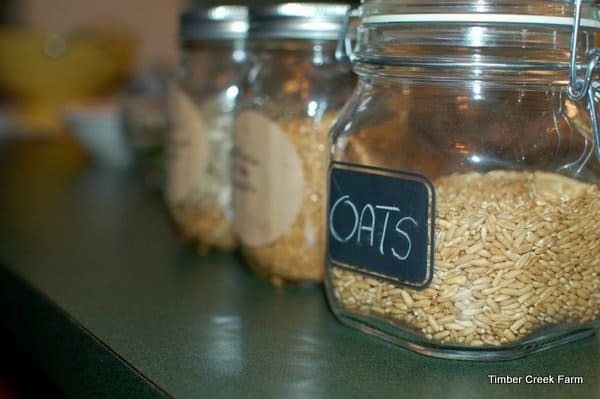 Add in all sorts of healthy foods such as dark leafy greens, oats, chopped garlic, flax seed, sunflower seeds, and fresh herbs. 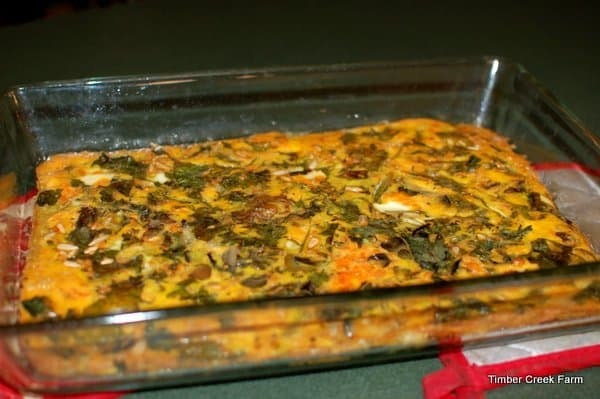 Flax seeds will add additional Omega 3 fatty acids to the dish. We all need more of this! Sunflower seeds are high in fat but a great source of protein and B vitamins. Sunflower seeds are also high in manganese which if useful for strong healthy feather with a high gloss! Greens are healthy and fully of antioxidants and vitamins. People often wonder about using spinach with chickens. Spinach is probably ok in very small quantities but it does contain a substance, oxalic acid, that inhibits calcium absorption in chickens. Even though spinach is high in Calcium it may be counter productive to feed it to chickens. (adding a splash of Apple Cider Vinegar to their water can counteract the oxalic acid) Read more about feeding spinach to chickens on Fresh Eggs Daily. Greens such as dark leafy lettuce, kale, Swiss chard and beet greens are a better choice. Most herbs are good for chickens, but some chickens prefer some over others. Its probably an individual taste and aroma thing. I tend to stick with the savory herbs for the egg dish and not the mints. Oregano has some natural worming properties and is a good herb to add to the chickens diet. I also added sorrel, parsley, and rosemary. Other herbs and botanicals you could add are dandelions and greens, comfrey, nasturtiums, and marigold blossoms. Garlic is always a good choice to add as it also has some natural healing properties and promotes good health. A word about dairy. You will see me adding shredded cheese into the egg dish in the video. I don’t give our chickens a lot of dairy products because they can cause some stomach issues and potentially lead to diarrhea. However, as with most things in life, a small amount in moderation, is not a bad thing. It ups the calcium level of the recipe and adds flavor. Now for the fun part! Watch my Cooking for Chickens Video! It’s like a really bad episode of a cooking show on cable. Sort of. Grease a 9 x 13 baking dish. 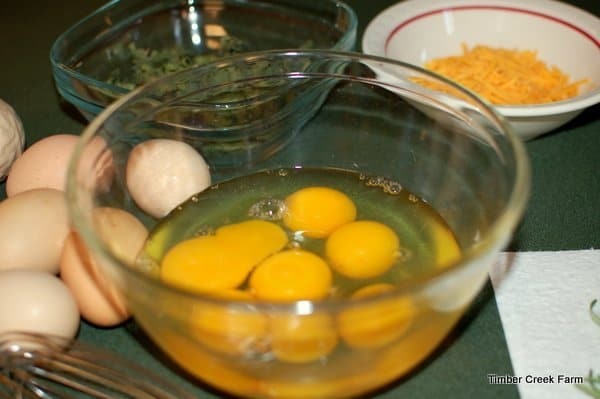 Pour the beaten eggs into the baking dish. Add the greens, torn into small pieces. Bake for 20 to 30 minutes until eggs are thoroughly cooked. For warm weather, I refrigerate the casserole to chill completely before feeding to the chickens. When ready to use, I cut the egg bake into small pieces and sprinkle the pieces into the chickens bowls on top of their layer ration. But, of course, you can just feed this to your chickens however you like. 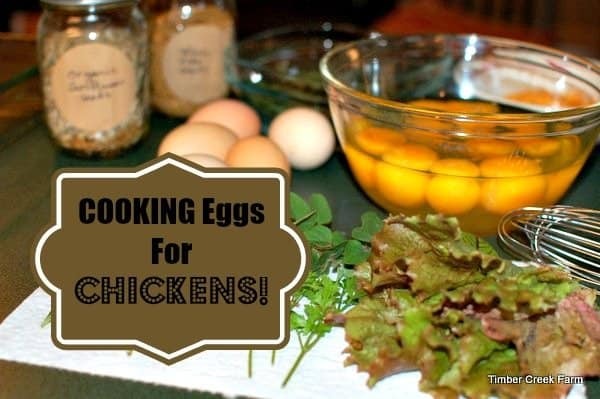 Cooking eggs for chickens is a great way to add in some extra nutrition while giving them a treat. I know my chickens are disappointed when I arrive empty handed! Of course sometimes they just get a handful of cut up grass but occasionally they get a nice fluffy egg casserole! 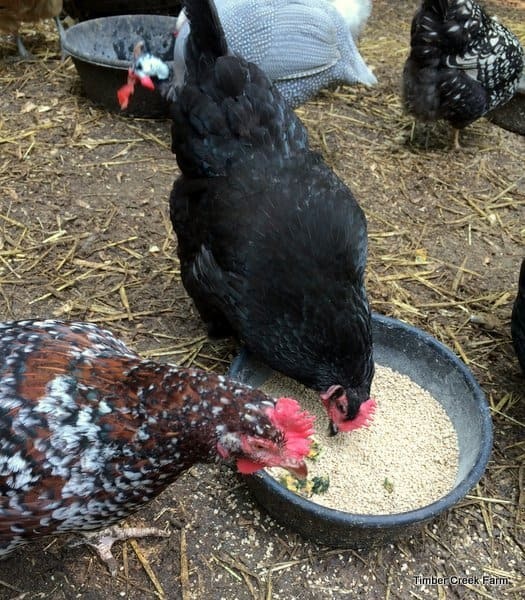 Are you interested in more information on raising chickens? 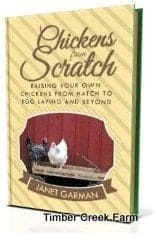 My new book “Chickens From Scratch, Raising Chickens from Hatch to Egg Laying and Beyond” is for you! Check out the sale page on this site. So glad I found your site. I have too many eggs from our 12 girls. An egg mountain! Why are chickens such a worry. I have had mine just a few weeks and they are the madest bunch ever. I know they can lay an egg a day but it must take a huge amount of energy.